Next time you are in the San Marcos library stop by and view our display in the lobby. The schedule for upcoming hikes and our mission statement is in the left hand case. 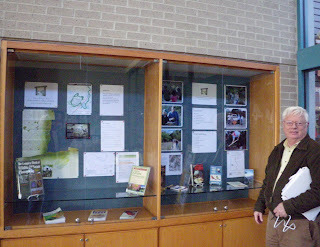 Photos of our great volunteers and greenspace users line the right hand display case. With the upcoming cold weather you might want to check out books to prepare you for the awesome Spring we’re sure to enjoy! Don’t forget to think about that perfect photo and how to capture it for our Naturescapes contest next summer. Special thanks to board member, Charlie O’Neil and the staff at the San Marcos library for making this happen. The display will be in place during the month of January 2010. Ringing in the new year with great ideas for getting outdoors!